Do you want to feel refreshed whenever those bad odors occur at home or in anywhere else? Would you like to inhale a fresh nontoxic smell that gets instead of those strong products? Well, not to worry now as EcoDiscoveries created an Airzyme Cleaner just for this. To give us the needs and satisfied us in our everyday. We won't feel guilty of using a solution now, as we know that it is Extremely Safe not expected to aggravate asthma or other allergies. Generally safe for use around pregnant women, children, the elderly, and those with mild-severe MCS or otherwise compromised immune systems. And this truly applies to me as sooner or later we will have a new bundle of joy, the newest member of our family will soon arrive. The product came in the mail through UPS and what's in the package was the refillable spray bottle, the complimentary starter bottle of the concentrated Airzyme Cleaner. The procedure of mixing the concentrated products with a tap water is truly quick and easy. I'm glad they do that because it's less waste of the environment too. Using the product is indeed wonderful. I sprayed it in our bathroom after it smells spitefully and it was definitely great, no strong smell at all. Works amazing and worth the money you spend. I would recommend this to a family and friends who is looking for some fabric deodorizer as I am happy and satisfied with the product. Where to find this product? Please visit ecodiscoveries and follow them on social media to learn more about their amazing products and get connected to an exclusive offers online. Anything eco-friendly is preferable at my household. I haven't tried this one out yet. I will check them out online or look for it in the store. My dad who usually cleans our house, will surely love this one.. especially it's eco-friendly. This is something that we need at home. Cooking inside a condo unit leaves behind unwanted odors in the kitchen all the way to the bedroom. 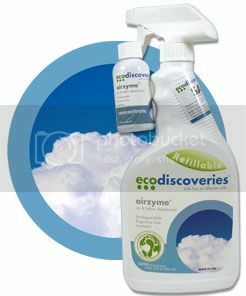 And since my son and I both have allergies, this eco-friendly enzyme cleaner is ideal to use in our home. I wonder if this brand is available here in the Philippines. I want to try that product Mommy N especially when Maggie is out playing around the family room. i do vacuum almost everyday still you can smell her a little bit.